The transfigured light that radiated from Jesus has inspired many as an image of our potential for holiness. 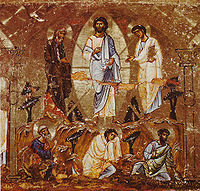 Some Eastern Orthodox spiritual writers such as Gregory Palamas and St. Seraphim of Sarov believed that they saw the light of Mount Tabor within. Jesus’ self-designation “the Son of Man” is also rich in possibilities for humanity. Walter Wink famously suggested that the phrase “Son of Man” refers to a newly created humanity in Christ. This fits well with St. Paul’s use of the phrase “New Humanity” in Romans 5. For the likes of the disciples and us entry into the new humanity in Christ is not smooth sailing into transfigured light. The disciples quickly return to arguing about who is the greatest. We all know the anger and other discordant feelings that overtake us quickly every time we sense any hint of the transfigured light in our lives. Even Moses and Elijah were both compromised with violence which they had to overcome in the same way we have to overcome our own violent impulses, petty as they often are. How Is the Gospel Veiled? We celebrate the Transfiguration of Jesus at the end of Epiphany to prepare ourselves for Lent. This is a joyous feast where the Light of Mount Tabor should inspire us for the days of penance and then entering into the Paschal Mystery of Christ. However, there is a discordant element in the reading from St. Paul that I want to focus on. He, too, writes of the inspiring light of the Transfiguration, but he also writes about the veil over Moses’ face. This refers to the story in Exodus where Moses put a veil over his face when he came down from Mount Sinai with the tablets of the Law because his face shone too brightly for his fellow Israelites to look upon. (Ex. 34: 29–34) Paul goes on to say that the Jews remain veiled when they hear the words of the Law. In light of Holocaust, this verse causes much uneasiness, all the more so as it has been used to justify anti-Semitic attitudes and behaviors. Unfortunately, the lectionary stops short of the two verses that are of upmost importance for putting the veil in perspective. The reading concludes with 2 Cor. 4:2 where Paul says: “We have renounced the shameful things that one hides; we refuse to practice cunning or to falsify God’s word; but by the open statement of the truth we commend ourselves to the conscience of everyone in the sight of God.” At this point, Paul is no longer talking about the Jews and the Law; he is talking about the right conduct expected of any follower of Christ. The next two verses bring back the image of the veil: “And even if our gospel is veiled, it is veiled to those who are perishing. In their case the god of this world has blinded the minds of the unbelievers, to keep them from seeing the light of the gospel of the glory of Christ, who is the image of God.” What is crucial is that the veil is not cast over the minds of Jews reading the Law; the veil is cast over all who are unbelievers. Moreover, it is “the god of this world” that has cast the veil. This is a veil cast over everybody. Is the same veil cast over the Jews? Is this veil cast over those of who follow Christ? The answers are Yes and Maybe in the sense of Probably. This goes a long way to the longer answer to the second question. All of us are trained from birth to affirm our culture and family. We also derive identity from political parties, churches, schools of thought, social sets, and much else. That in itself does not constitute a veil, but if these ways by which we define ourselves take precedence over Christ, they veil us from the Gospel. Such identifications are the specialty of “the god of this world.” If we accuse other people of being veiled, we only put the veil over our own faces and so fail to see the Glory of God revealed on Mount Tabor. So let us examine ourselves for anything that casts a veil over Christ and cast it off so that we cast ourselves onto the mercy of Christ’s Glory. The glory of God revealed on Mount Tabor is dazzling. It is rightly seen as a vision of the glory of the created universe in all its materiality as well as a vision of the glory of the resurrected life. The presence of Moses and Elijah, representing Torah and the prophets, adds the weight of Jewish history to the moment and the voice from Heaven proclaiming Jesus as the beloved son entwines itself into this glory. But this turns out to be a strange glory as the world understands glory. On the way down from the mountain, Jesus tells the disciples who came with him not to tell anyone until the “Son of Man” is raised from the dead. The disciples remind Jesus that it was believed that Elijah should come first. Jesus then says that Elijah has already come and people did to him “whatever they pleased,” something Herod saw to. Jesus is reminding his disciples, and us, that death through collective violence is an old story that has been enacted since Abel to John the Baptist as a current event, and it is a story that is going to continue on in the lives of the apostles and on into our lives as well. It is through following Jesus who followed the prophets before him that we enter the glory of the transfigured life of the created world which explodes into the glory of the resurrected life filled with God’s love for those who do whatever they please with God’s beloved children.